As anyone who has created one of more millefiori canes, you know that there are some really awesome canes and some really not so awesome canes that you have made. One of the things that I like to do is create a “library” for my canes. This idea is not my own, but evolved from a discussion in one of the FaceBook groups I am in. Many people talked about how they store, collect, and display their canes for future reference or use. I was going to make my “library catalog” of millefiori canes using a composition book where I had made multiple “white” pages using Gesso … alas, once I began to put my canes onto the pages, after just 2 categories of tabs, my notebook was so thick, I actually hated it. So … I had to think and come up with something that I would like, would be easy to use, & not in notebook form. 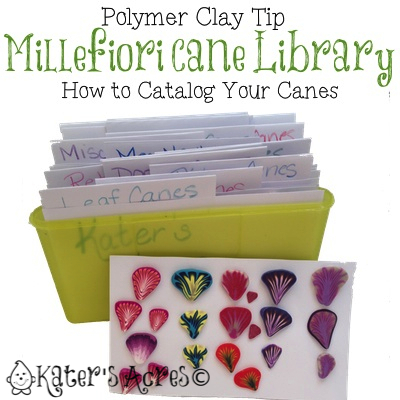 So … here it is, my super easy millefiori cane cataloging system. I took a standard index card box and blank index cards, handmade my own tabs using card stock & a few staples, and made an indexed system of cards that I can easily add, remove, or write “notes” on any of my millefiori cane cards. Thanks for joining me today, I hope you make one of these for yourself! Hi! Thank you for posting the Cane Library Solution. I enjoy tips on storage as it’s one of the biggest issues I face being new to Polymer Clay. Not a problem Janelle! I’m so glad you enjoyed it and can use it as well.